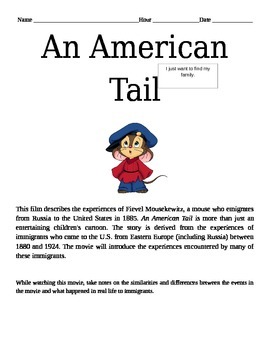 This four page project is used to help students see the differences and similarities between prior immigrant experience research and the movie, American Tail. After completing in class research on the immigrants experience, students watch the cartoon, American Tail, looking for similarities and differences in the experiences of these "immigrants". As a culminating activity, students write a letter to Steven Spielburg, the director, explaining the similarities and differences and applauding him/criticizing him on his portrayal of immigration. This product includes a template for note taking during the movie, as well as a template for writing the letter.